Lehua spent the first few years of her life living alone under the dark crawl space of a house. When her guardians grew tired of feeding and cleaning up after Lehua, they decided to let her come live at Leilani Farm Sanctuary. Upon arriving at the Sanctuary, Lehua enjoyed having acres of pasture and the company of goats, but she really yearned for another donkey. 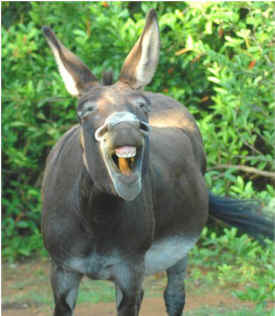 Equines are herd animals and are happiest with their own kind. 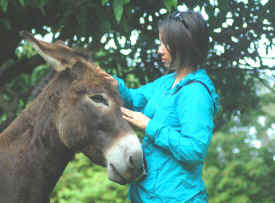 Meanwhile, at a nearby farm, another donkey (Jenny) was suffering from loneliness and depression after losing her best friend, a horse. Jenny’s mournful braying convinced her caregivers to do what would cure Jenny’s sadness: take her to Leilani Farm Sanctuary, where she could live with another donkey. Within seconds of meeting each other, Lehua and Jenny bonded -- and they’ve been inseparable ever since. They run together, sleep together, dust bathe together, and graze in the pasture together. When they do occasionally lose sight of one another, they panic and bray loudly until they are reunited. 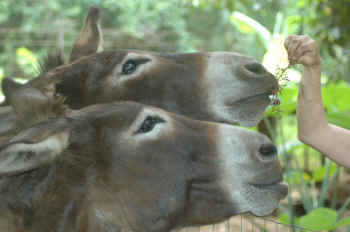 The two donkeys look almost identical, although they are unrelated. The only way we can tell them apart is by their behavior: Lehua likes to be kissed on the lips and Jenny prefers to be hugged. When visitors arrive at the farm, Lehua and Jenny vocalize greetings that can be heard as far as a mile away.